Sakon was the fourth member of the Sound Five. Sakon and Ukon both enjoy bad-mouthing the opposition. 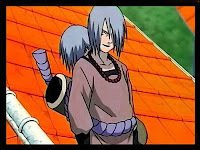 Orochimaru notes Sakon to be the fastest and strongest member of the Sound Five, traits Sakon is very proud of. When in battle Sakon likes to prolong the fight by toying with the opponent and all the while use unnecessarily powerful techniques. This tendency of Sakon's causes him to slow down the rest of the group whenever he gets interested in an opponent. Ukon is able to counteract this flaw by being more impatient and hasty than his brother, forcing Sakon to quickly end his battles. 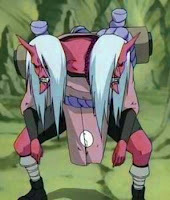 During the Sasuke Retrieval arc, Sakon and Ukon fight and almost kill Kiba Inuzuka and Akamaru. Before they can finish the two off, however, Kankuro arrives and kills them both with his puppets, saving Kiba and Akamaru.